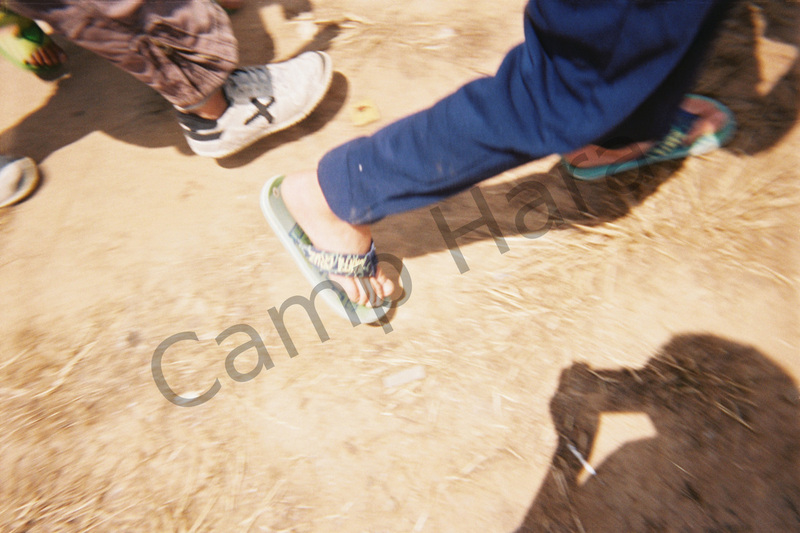 All photos below have been taken during the summer of 2016 by refugee children living in camps in Greece. Ages ranged from 2 years to 15 years. All photos are in their original form, none have been photoshopped, altered or cropped in any way. 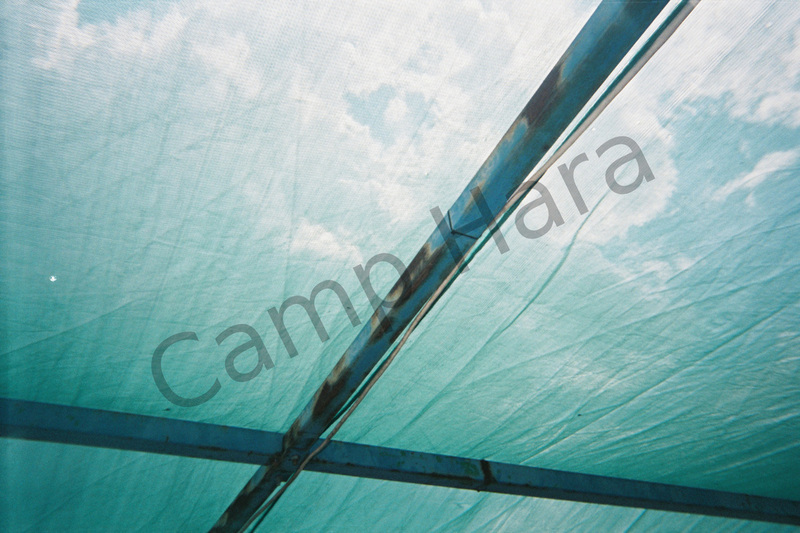 Prints have been developed directly from negative film and therefore are of higher quality in tone, colour and texture than the pictures found below. For the complete background story to the project please click on the blog button above to read. If you would like to purchase a photo please contact me either by email, phone or facebook. 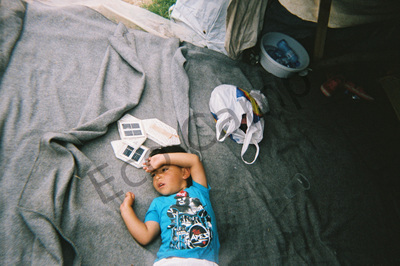 All donations go directly to my work with refugees. Smaller children were often bathed outside with big buckets of water - and lots of soap. An incredible depth of expression captured by a child. 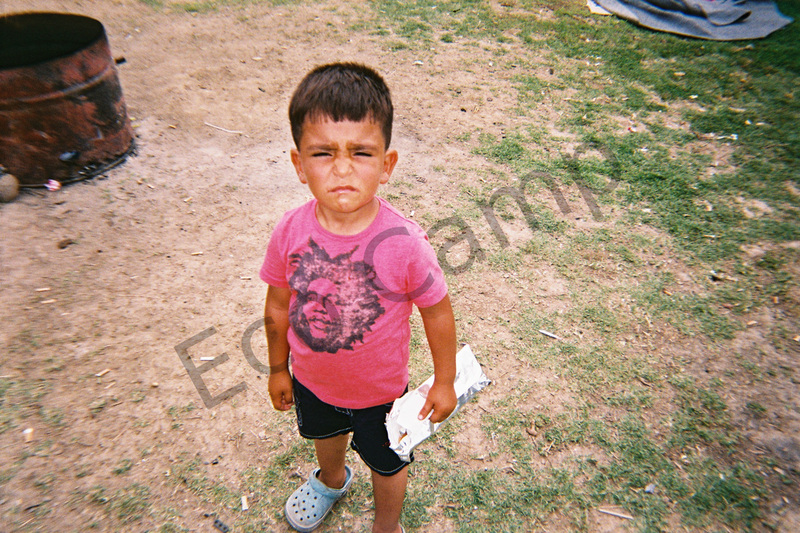 This little boy was Kurdish from Syria, his mom had been an Arabic teacher and his father a pharmaceutical salesman. His brother stands above him taking the photo. Many refugees living here had made larger tents (visible in the photograph), which housed 2 smaller vinyl tents inside. Clothes hang in between the tents. Here there was running water for people to wash their clothes by hand in large plastic bowls. Every time I saw this little guy, he had a sour expression on his face. Only when I gave him and his older brother a camera, did he break into a big smile. Little girl from Syria turns back to smile at another child taking her photo. What struck me the most in all these camps was that no matter how hot and hard the conditions, the children were so often smiling and laughing. A surprising photo to be found amongst the rolls of film, this woman could be seen in a series of other photos having her make-up done by another woman in the camp. 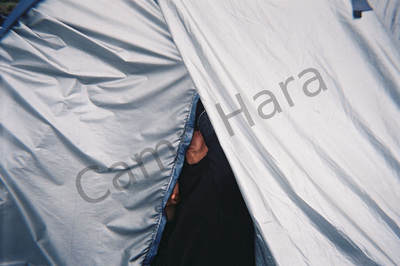 The UNHCR canopy above providing a roof is in stark juxtaposition to the woman's powerful outward energy, which the child was able to capture in a brief moment. Little boy from Syria lays inside his tent. 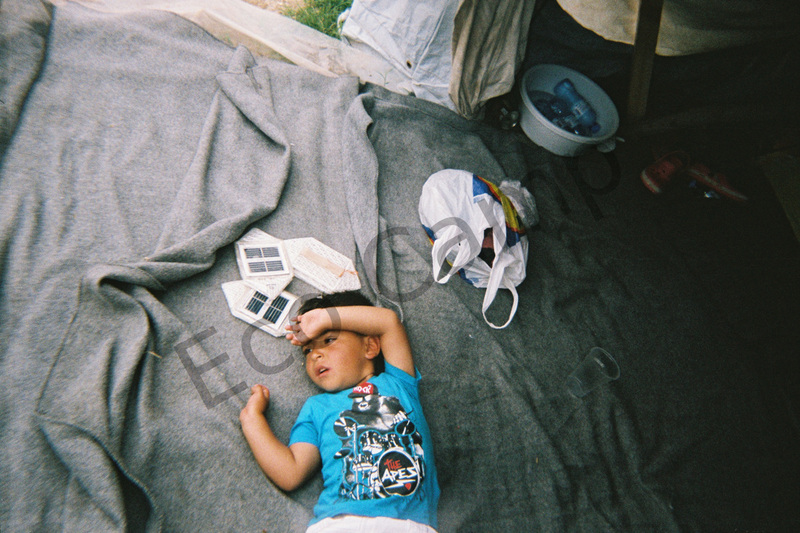 There is a draining combination of heat and boredom in the camps during the summer. A young boy takes a picture of an older boy's tatoo, holding the back of his sleeve up with his left hand (visible in the top left corner) to expose the design, while taking the photo with his other hand. 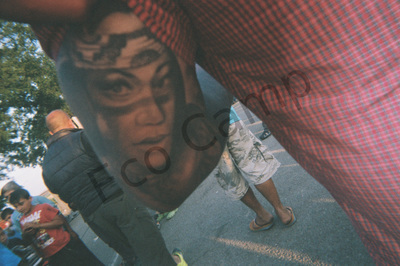 The indigenous woman's face is powerfully moving and meaningful here. The shadows of 3 boys reflected on the asphalt in front of a group of refugees standing in line for food. 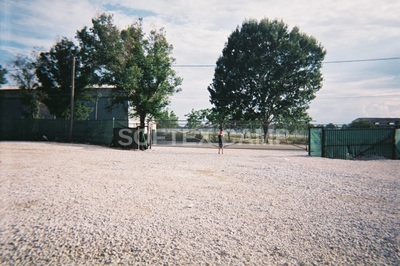 The shadow on the far left holds the camera and took this picture, while the shadow in the middle is from the boy who can be seen in the far right of the picture. 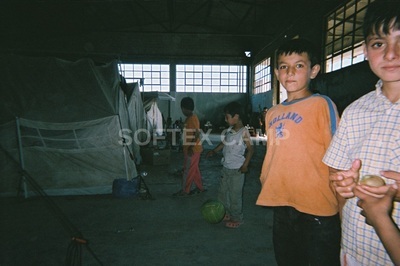 Little Kurdish Syrian boy, dressed in clean white and red clothes holdng a ball. 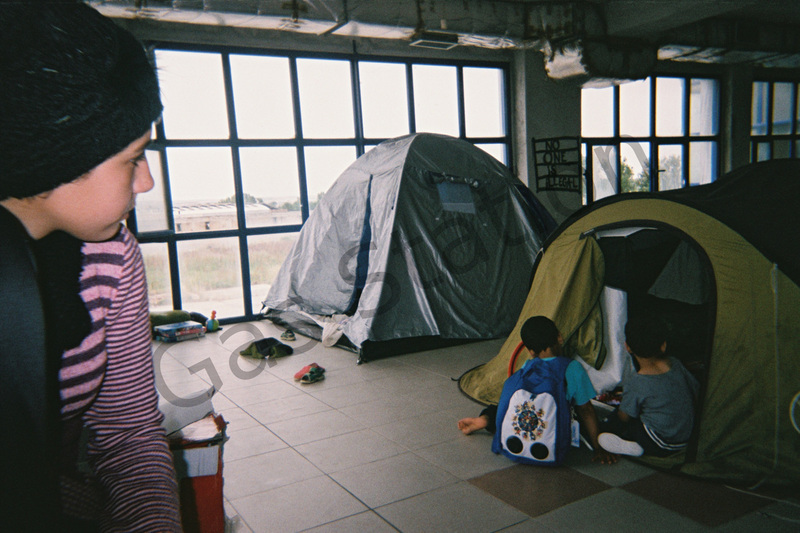 His brother takes the photo from inside the tent. 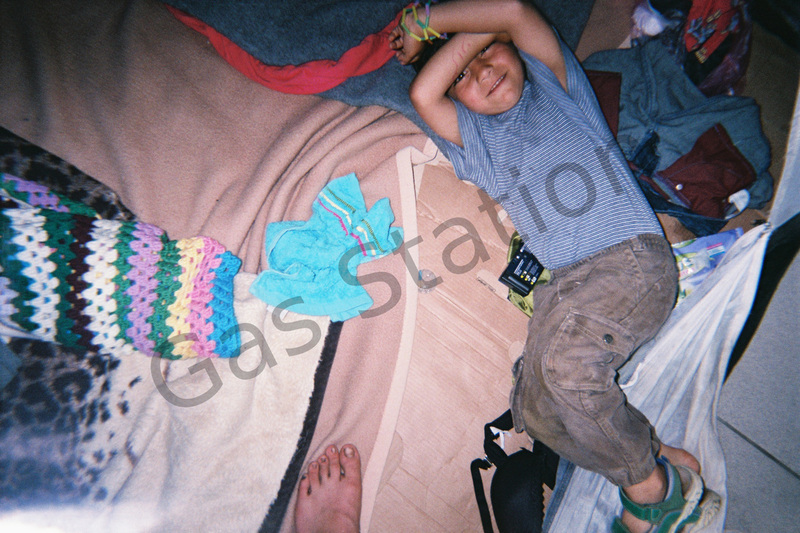 Little boy upstairs in the gas station building. Through the open window the volunteers camp can be seen. 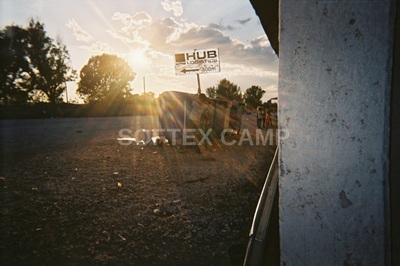 This "camp" was basically an open field behind Park Hotel where we all slept in tents and worked during the day in the Idomeni/Polykastro area. It is also the site of the "Idomeni Kitchen" - an outdoor kitchen which served up to 5,000 refugees daily. 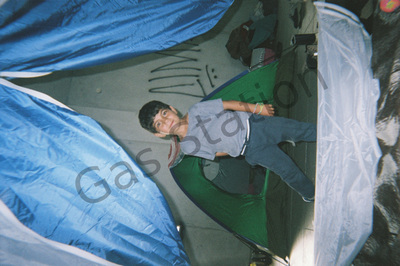 A little boy partially shields his face inside his tent, inside the abadoned gas station building. 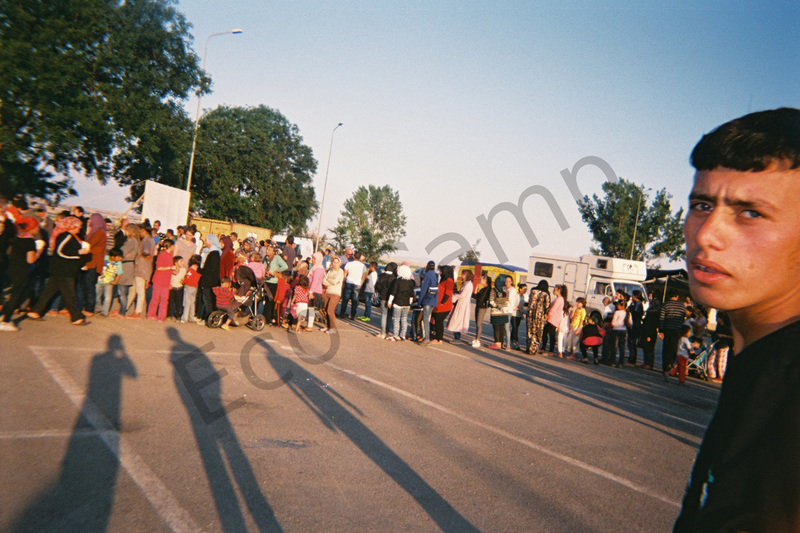 Several families refusing to go to a military camp, had left Idomeni before its evacuation and taken up shelter here. 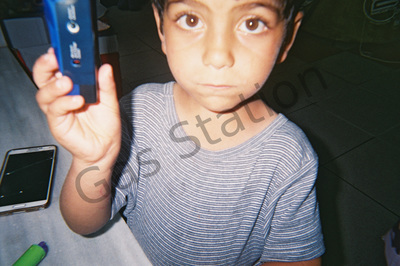 Little boy with one of the disposable cameras I collected. These children at the gas station ran to me each day with empty cameras, begging for another. 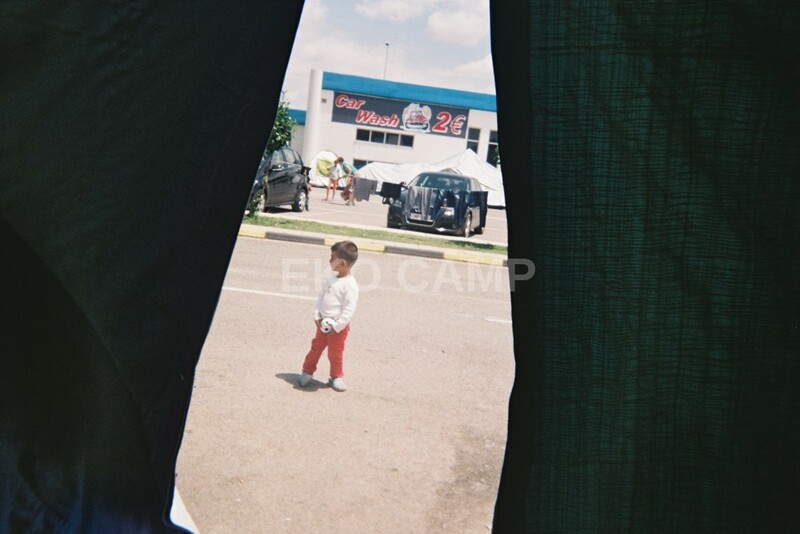 A little boy stands inside the empty gas station, his brother takes the photo from inside their tent. 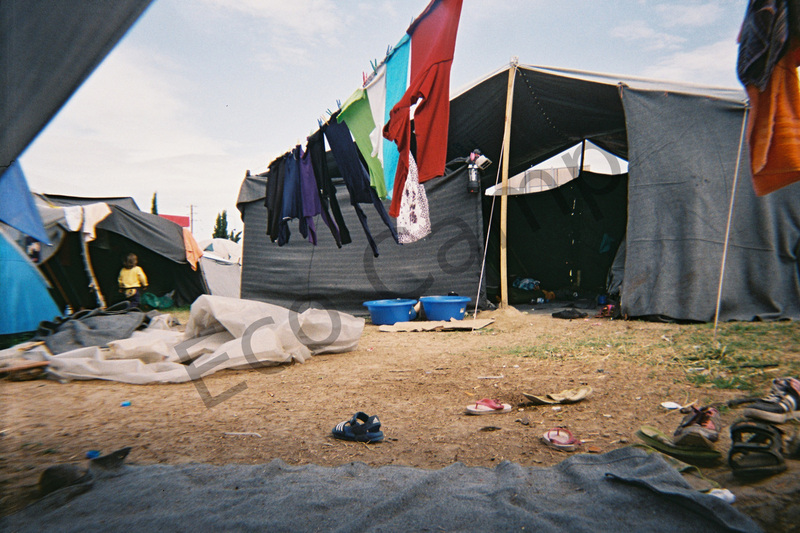 Families not wanting to live in a military camp, had spent days cleaning out the broken glass, metal and garbage from this 2-storey building before putting up their tents inside. 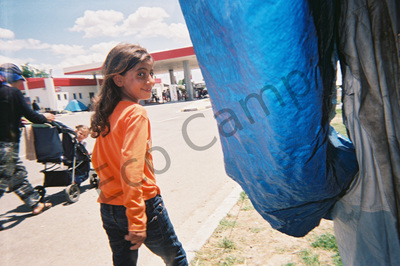 Young girl inside the gas station looking at the tents behind her. 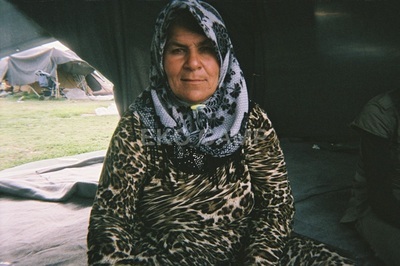 She had asked me for a pair of pants the day before because hers were ripped when a policeman threw her to the ground as she tried to run away from Kavala military camp nearby. She smiled as she told me. On the wall in the background are written the words " NO ONE IS ILLEGAL". 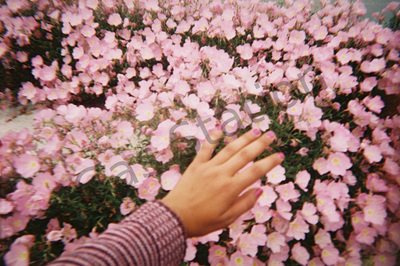 This little girl from Syria had painted her nails and using the only bed of flowers to be found around the gas station, she had taken this photo with her other hand. On her roll there were many pictures "featuring" her painted nails. 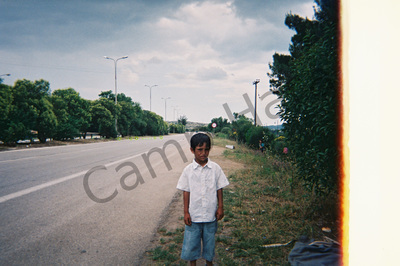 Little boy standing at the side of the road. With nothing to do here all day, many children could be found walking along the roadside just outside the camp. Hara was not visible from the main highway and therefore was the last camp to be evacuated in the summer of 2016. 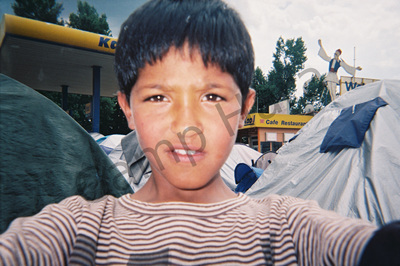 Little girl from Afghanistan taking a selfie. There were many refugees from Afghanistan in this camp, knowing they had little to no chance for asylum in Greece, they stayed here hoping to cross in the night by foot over the mountains into Macedonia. 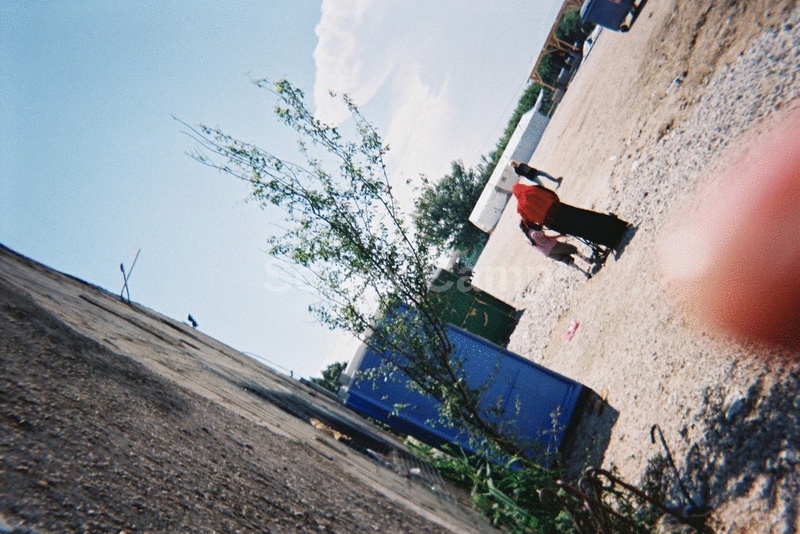 A little boy stands in the foreground, a mother pushes a stroller behind him. 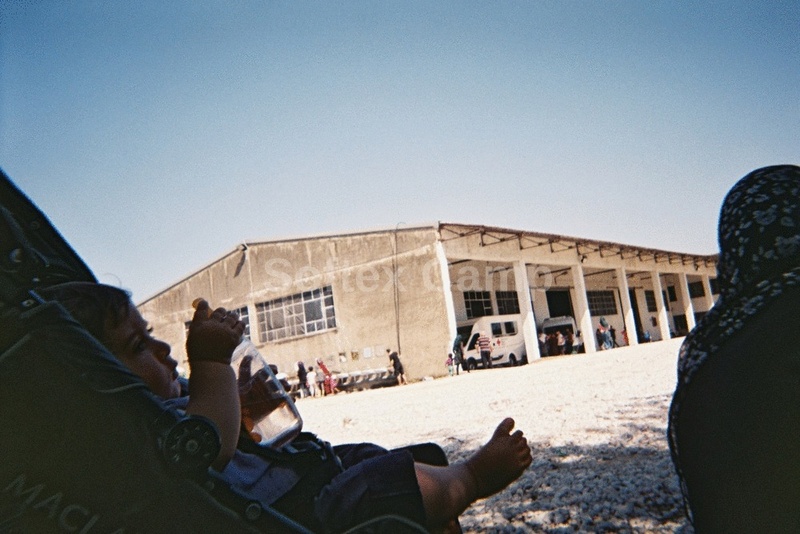 The tents in the background, sitting on the hot and dusty asphalt felt like saunas inside. 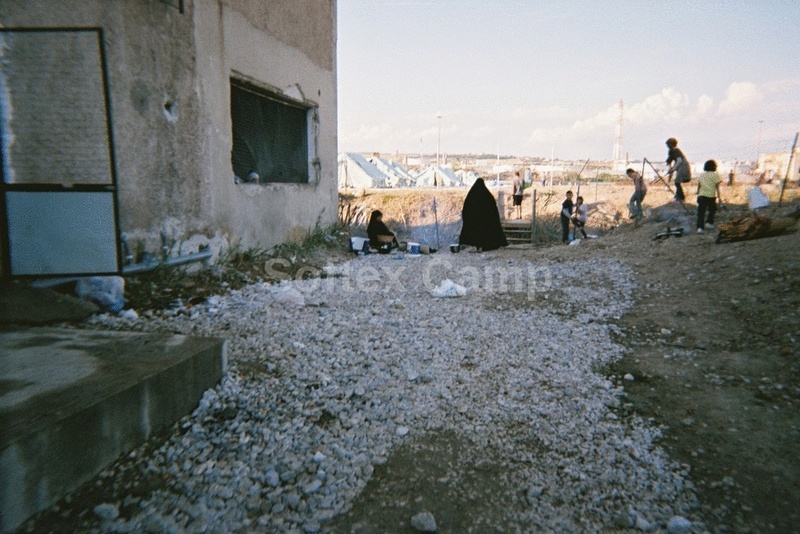 Although there was a gas station here and small cafe, there was no running water available for the refugees. Showers cost 5 euros. A group of 4 boys from Afghanistan. They were absolutely fascinated and thrilled with the cameras. They often took pictures of themselves or other people but also simply of the sky or clouds, or a tree. On one of my many visits to this camp I had sat for some hours in this woman's tent listening to her story as she offered me tea. A Syrian mother of 5, she had tried 40 times to cross the border in the night over the mountains with her children. Each time, only to be captured by Macedonian police and brought back, often soaking wet and freezing. Clouds are visible through the thin plastic roof of an overhead canopy that shelters several tents beneath it from rain, however, not from strong wind storms that often destroyed many tents in the night. It didn't take long for children to realize I was giving out cameras here. 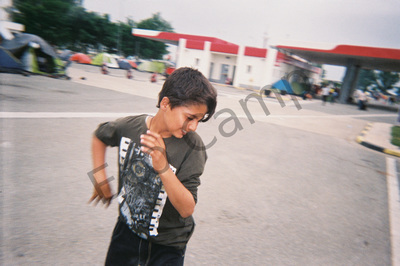 This group of 4 young boys aged between 8 and ten years old from Afghanistan quickly came asking for a camera and then all ran off to take pictures throughout the camp. 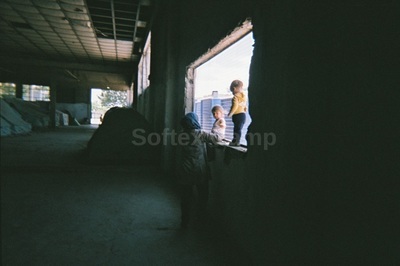 A mother stands beside her 2 children on the windowsill inside the main camp building. Some windows are open, but there is little air movement through the building causing not only stale air but also incredible heat during the summer. In the winter there is no lighting or heating inside. 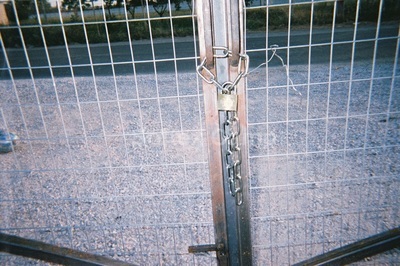 The padlock on the front main gate of the camp. 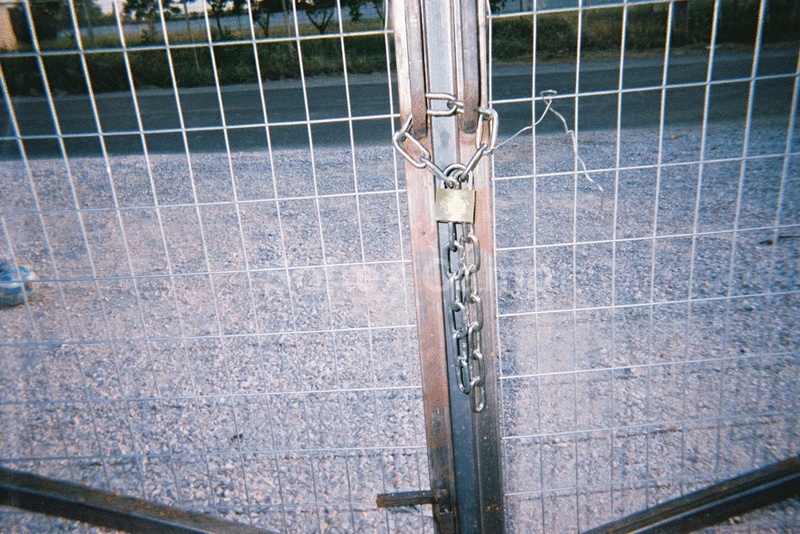 Every evening the gates are closed and locked to prevent anyone from coming in or going out. 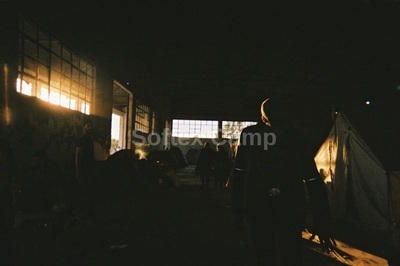 Nevertheless, mafia and others make there way into the camp at nightfall through the back of the camp and holes in the fences. The only light to be found streams through the windows of the main camp building, which houses over 600 refugees. Off to the right a man reaches out his hand to a small child in the shadows behind him. With the main building full to capacity, more tents were set up outside beside and behind the camp. While many refugees told me they preferred to stay outside in the fresh air, they also then faced the problem of being unprotected from rain and wind storms. 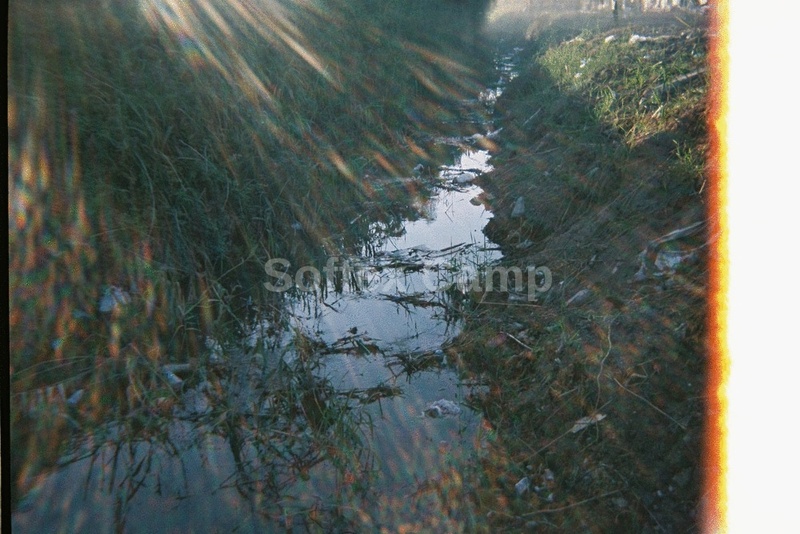 Rays of sunlight fan out across a small stream that runs just behind and outside the back of the camp. It is the only "nature" to be found around the camp and people and children can often be found spending time here. 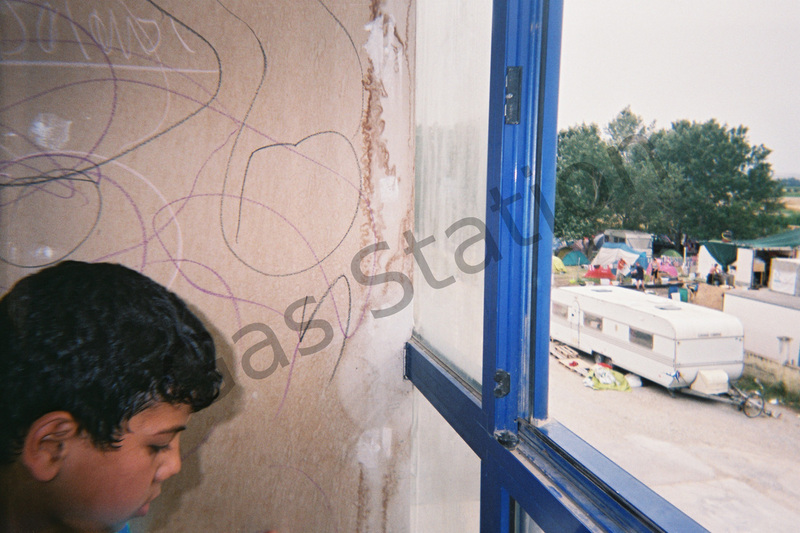 An ascewed picture taken of the outside wall of the main camp building, the small finger of a young child visible in the bottom of the photo. In the foreground of the picture, a mother, daughter and baby in a stroller walk along. Small baby Ibrahim sits in his stroller, holding a baby bottle in the foreground of this photo. His mother sits to the right. 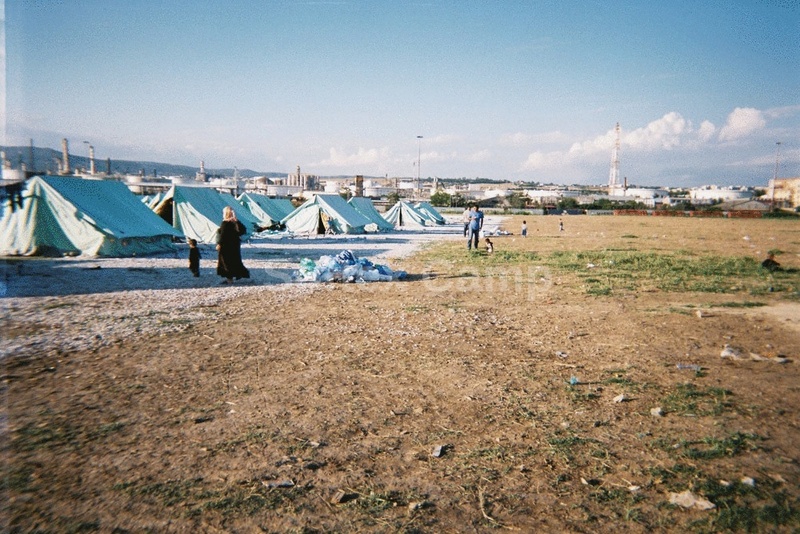 In the background, the main camp building housing hundreds of refugees, can be seen. This baby is no longer in Softex, his family left on foot in August of 2016 and is now living in Germany. A woman making a small fire for tea behind the camp, children play on the fence. Many families preferring not to spend the whole day within the confines of the camp, came back here to have some semblance of normalcy and freedom in their everyday lives. The large front gates to the street are closed as evening approaches, a little boy plays with the large padlock which secures the gate. (One evening 300 Greek protesters stormed the gate, breaking it open and encouraged the refugees to all leave, shouting at them not to be "kept as animals". 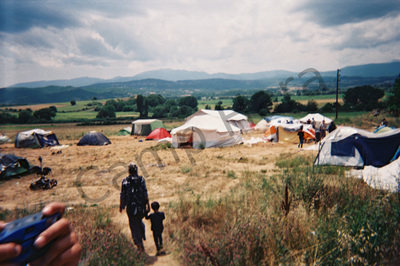 A dozen or so refugees followed them, only to return to the camp some days later, having found no where else to live). A boy stands on the bridge, overlooking the small stream that runs behind the camp. 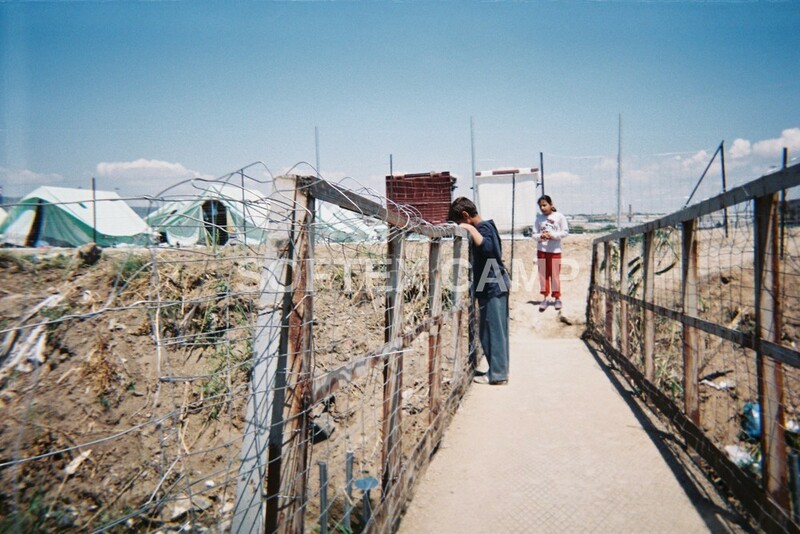 The beautiful composition of this photo set between the barbed-­‐wire fencing gives a paradoxical feeling. As the sun sets in the background two boys play around a sign post for a computer company down the road. All the military camps, like this one, are strategically placed well outside the city in barren industrial zones . . . "out of sight, out of mind". Running along the outside wall on both sides of the main camp building are a row of simple basins for people to wash themselves. Up until the end of August, there were no showers in Softex, only these open sinks. When I was last there in September of 2016 they had installed 2 plastic showers outside in the middle of a row of porta potties. There are currently 1,339 people living in Softex. Two older boys in the foreground watch as a smaller boy takes their photo. One of the boys is holding an apple from another child. Behind them, Wesam and Aboodi can be seen, one with a ball, another in an orange t-­‐shirt. 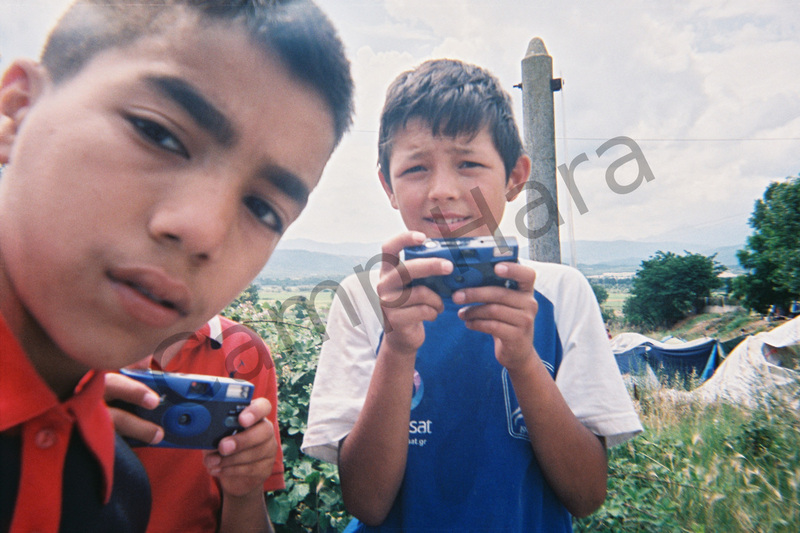 These 2 boys, along with their family, left the camp in August of 2016 on foot and are now all in Germany. 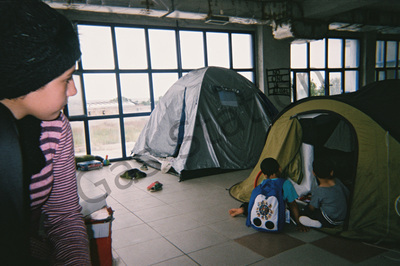 The other two boys in the photo still remain in the camp.